A remarkable fifteenth-century folding almanac in a green and pink silk binding was recently acquired by the Wellcome Library. It stands out because of its exquisite textile binding, and the high artistic standard of its illustrative features, particularly the Zodiac Man. Only a handful of such artefacts survive, and this particular example had been in private hands and was previously unknown to scholars. The almanac is written in Latin, and contains a calendar and astrological tables and diagrams, including lunar and solar eclipses. The text, diagrams and images are in brown, red and blue ink with gold leaf. This item joins two other medieval folding almanacs in the Library: MS. 39 and MS. 40. These slightly later almanacs contain much less sophisticated drawings than our new acquisition. The noticeable differences between these objects raise intriguing questions about how they were produced and used. Folding almanacs contain astrological, medical and calendrical information and were highly portable objects, constructed to hang from the owner’s belt and unfold like a modern-day map. Their format points towards their highly functional purpose: they were reference tools for medical practitioners and others who used the data they contained to diagnose and prognosticate, as well as to obtain information about the phases of the moon, religious feasts and other key moments in the calendar. 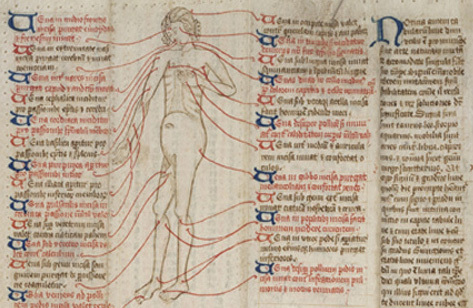 This usage reveals the importance of ideas about the cosmos to the understanding of the human body and the practice of medicine in the Middle Ages. In the Zodiac Man, particular zodiac signs are placed on specific parts of the body, to indicate times in the year at which it was believed to be dangerous to practice bloodletting on those areas. The Zodiac Man complements the Vein Man, which shows the appropriate points on the body from which blood should be let in usual circumstances. The modest, compressed form of the almanac contrasts with that of larger scale, more luxurious astrological manuscripts such as ‘The Physician’s Handbook’ (MS. 8004). Almanacs’ practical function suggests that they were both ephemeral – readily discarded and replaced – and relatively inexpensive to produce, as the somewhat crude illustrations of MS. 39 and MS. 40 would indicate. The Library’s new acquisition, however, appears to be a very different kind of object. Its fine artwork and binding, as well as its excellent condition, indicate that this was a valuable and prestigious item, which was perhaps never actually used. It may have been commissioned by a wealthy patron as a special bespoke item, in contrast to the more workaday almanacs that were probably produced in workshops in multiple copies. 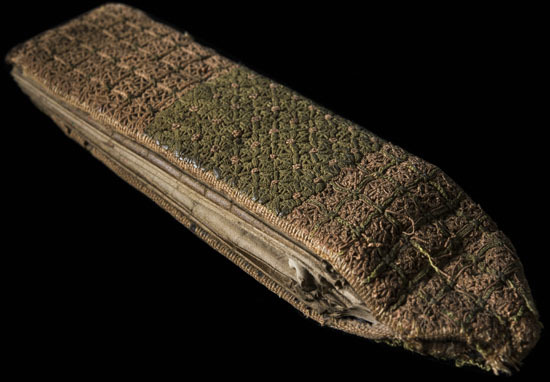 This suggests that the folding almanac was a more versatile type of object than has previously been supposed, and could be a precious possession, as well as a tool of medical and scientific practice. The most recent known owner of the almanac was the poet Dame Edith Sitwell (1887–1964), who received it as a gift in May 1940. We do not know who first owned it in the fifteenth century, but it could have been commissioned by a lay person who was not a physician or surgeon, yet had a keen interest in the astrological and calendrical data within it, and wished to have a special exemplar of what may have been a very fashionable manuscript format. 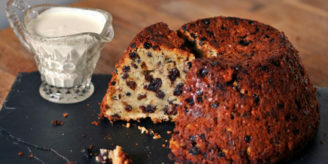 Use could have been made of its medical content within the household, although the absence of the Vein Man may suggest that it was never intended to be consulted for practical purposes. 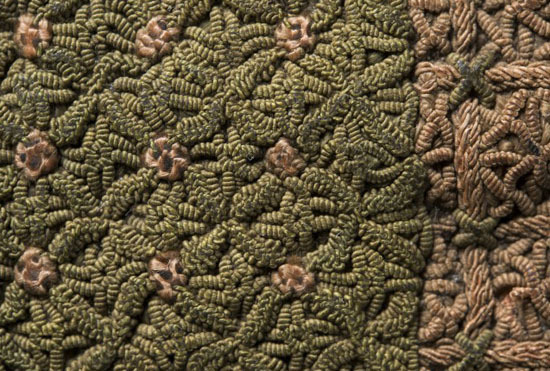 The original owner could have been a woman, and the textile binding could have been woven by the owner himself or herself, or within his or her household. This jewel-like, enigmatic object raises important questions about who possessed medical and scientific knowledge in the fifteenth century, how that knowledge was used, and the status and significance of folding almanacs at this time. 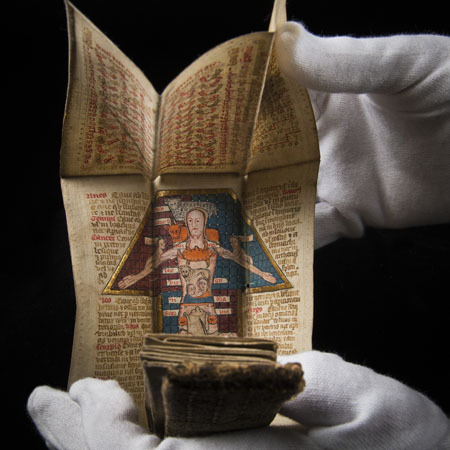 It encourages us to see such manuscripts as unique physical artefacts as well as repositories of information, and reminds us that medieval manuscripts existed in other formats than the standard codex. Indeed, the special manuscript format of the folding almanac merits further study, and we hope that scholars of manuscript and book history, as well as art historians and historians of medicine and science, will shed further light on our new acquisition. Sir Henry Wellcome sought to acquire folding almanacs for his collection in the early twentieth century, and this acquisition increases the importance of the Wellcome Library’s holdings for the study of medieval astrological medicine. Much remains to be discovered about this fascinating manuscript, and we are delighted to have added it to our collections. 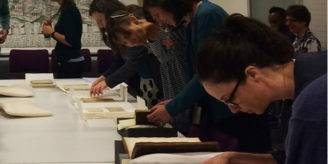 Author: Elma Brenner is Specialist, Medieval and Early Modern Medicine at the Wellcome Library. Thank you so very much for sharing this beautiful book with us. Fantastic item! The detail of the needlework is most appreciated. Do you know of any instances of medieval calendars/artefacts that contain original verse or prose? René Stuip and I wrote an article about calendrical verse: ‘‘Martin fights in July, and he strikes St. Vaast with the font.’ A Cisiojanus and a child’s alphabet in Oxford, Bodleian, MS Rawlinson Liturgical E 40’, Cahiers de Recherches Médiévales et Humanistes / A Journal of Medieval and Humanistic Studies 19 (2010), pp. 493-521. You do not say where you think the almanac was made. Is there a suggested place of origin?